We will have a short maintenance window tonight starting at 11PM PDT and lasting for roughly one hour. Make sure to save your games prior to this time. We released many new features today, including a new fast game format called Blitz, an overhaul to our Pro Shop, improved Country Club invitations, a new Legend Golf Ball, and Kilts (yes, avatars with kilts, our guilty pleasure). First, you can now choose to display only Pro Shop items that are available to you or just items that you don't own, as well as sorting by a variety of options. You now have the ability to compare up to 3 items see the attributes for each side-by-side, to help you choose the best one for you. And our new player reviews make it easy to hear what other people think about any item in the Pro Shop, or enter your own review. All Country Club invitations and requests for membership are now delivered via the Invitation tab on your Friends List. This should make it much easier to invite your friends to your Country Club and run your own tournaments. NEW AVATAR KILT - You can now dress your avatar in a classic kilt and look the part as you play historic St Andrews or Celtic Manor. We had fun with this one. Enjoy! NEW LEGEND BALL - There is a new ball available only to our top players in the Legend Tier, regardless of their Level. Its the longest ball available in the game today with extra carry and distance to help Legends compete more fairly from the Championship tees. NEW WGT PRO CLUB SET - This new set of clubs is available to players in the Pro and higher Tiers regardless of their Level, to help them compete against others with upgraded equipment. Many thanks to everyone who clicked on the recent “Flight 93 National Memorial Foundation” ads running on our site, as you all helped that charity raise nearly $50,000. You can still donate at http://www.honorflight93.org/. WGT was also a sponsor of the Flight 93 National Memorial fund-raising golf tournament at Essex Country Club in NJ. Here’s a photo of Tom Ridge (former Governor of PA, first Secretary of Homeland Security, and avid WGT player) and Richard Codey (governor of NJ) shaking hands after Tom’s spectacular chip. On the right is WGT’s own Stu MacDonald, head of strategic partnerships, which means he gets to play in all the fun golf tournaments. Also pictured is their caddy Danny, no relation to Danny Noonan from Caddyshack. The Masters Will Extend Their Coverage By an Hour Next Year. So Why Not More? Augusta National Chairman Billy Payne told ESPN that they will be extending the coverage of The Masters an extra hour next year. That means we will get 4 extra hours of the golf season's first major. My question is: Why not extend it further? Don't get me wrong, I like the fact that they have extended it an extra hour. But I want more. It took years before the brass of Augusta National even started showing the front nine on TV. For the past few years we've gotten to see the entire third and fourth rounds of the leaders, but that's about it. They've started catching on by having internet coverage of "Amen Corner" the past few years, but its only for a couple of hours. Places like Yahoo and even the PGA's official website are showing hours of coverage on their sites before the TV coverage comes on. I've played golf, albeit poorly, for many years. I know how long it takes to play, no matter how good or bad you are. Three hours isn't enough time to see a full round of golf unless you're playing "speed golf". This fourth hour of TV is a step in the right direction, but I think more is still needed. Since the times of the pairings in the first two rounds are all over the place, those of us who have to watch it on TV don't always get to see our favorite golfers. And if they don't make the cut, we don't get to see them at all. While making the cut is in the hands of the players, the amount of TV time they get is not. We get almost all-day coverage for the other three majors, you'd think that arguably the most popular major would get the same treatment. CBS shows half hour highlights around midnight to try and help us get our fix of the first two rounds of the Masters. Really? This still baffles me, and I'm sure I'm not the only one. I know this is a very exclusive tournament and an even more exclusive club to get into. There are many people of high standing that have never played a round on the course. I would think they could make a lot of extra money by airing more hours on television, but maybe its not about money to them. I'm not a member of the club, so I obviously don't know the whole story. Either way, an extra hour per round of my favorite tournament of the year is a good thing. Let's hope its a trend that continues over the years. We’ve added a new golf course to WGT—The Twenty Ten course at Celtic Manor Resort in Wales, UK. Celtic Manor is the latest championship course on WGT. It’s a free nine-hole closest-to-the-hole game, featuring nine of the best shots that the Pros will be facing on the new Twenty Ten course hosting the 2010 Ryder Cup. Visit our new Celtic Manor page to enter the tournament for a chance to win a golf trip for two to Celtic Manor in Wales. And don’t miss our new Drive The 15th one-shot experience. This is an extra hole that we created in addition to the nine-hole tournament, on the drivable par four 15th hole. It’s a crazy drive thru a gap in the trees directly to the green. You won’t be able to play this hole with your personal WGT clubs, just our standard starter driver, but we hope you have some fun and tell your friends to check it out too. It’s free with no WGT registration required. (15th Hole Tip: aim to the right). Note, the real-world Ryder Cup is being held Oct 1-3 on NBC, ESPN, BBC and SKY, so don’t miss seeing the Pros on Team USA and Team Europe Pros trying to hit the same shots that you will have perfected by then. Heads up! We will have a short maintenance window tonight starting at 11PM PDT and lasting for roughly two hours. Make sure to save your games prior to this time. WGT remembers 9/11 and supports the Flight 93 National Memorial Campaign. Help us honor the heroes of Flight 93 with a donation. 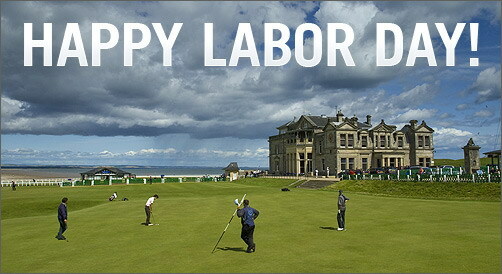 To all our US players, we hope you get a chance to enjoy some time off this Labor Day weekend, and if you can’t make it over to St Andrews for a quick round, then maybe play St Andrews with some friends on WGT! The site will be down for approximately one hour tonight, Sept 2nd, starting at 11PM Pacific Time. We are fixing a few bugs and performing routine system maintenance. Sorry for the inconvenience. Thanks for all the feedback on the new Level system that we released today. Levels are designed to help all players be rewarded by unlocking new virtual equipment and other prizes for them as the play WGT. Levels are separate from your Tier (Hack, Amateur, Pro, etc.) which are based on your skill and score history. The Level system is designed to be fair to all players, based on their love of the game and not just their skill. In this example, the player has advanced to Level 20 (L20) and has 3,270 of the 3,450 experience points needed to reach Level 21 and unlock more virtual equipment. When you reach a new Tier (Hack, Amateur, pro, etc.) we provide you with WGT Credits that you can use to upgrade your virtual equipment or enter tournaments. Here’s how many WGT Credits you earn at each new tier. Once again, thank you for your feedback on the new tiers and levels. We hope that you find that they present more challenges, more fun, and more great matches with friends, new and old.